When you go out for a ride on your horse, who's captain of the ship? 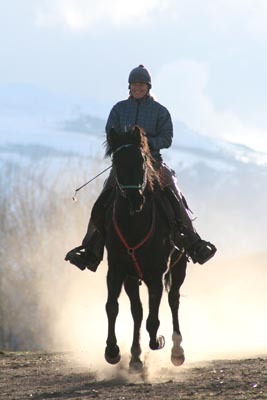 Are you in control of your horse, do you and your horse work as partners, or is your horse steering the boat? One thing to keep in mind is that your horse already knows everything you will want him to do. Your horse only has two buttons - stop and go, and 4 directions: forward, backward, left and right. 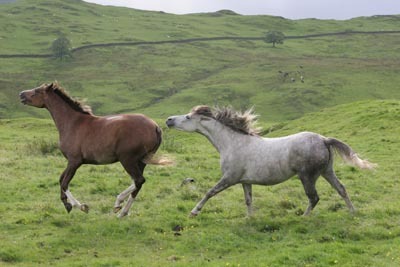 Watch any horse interact with another horse. Every horse knows these commands and directions. A day old foal already knows how to stop and go, move forward, backward, left and right. He may do it awkwardly, but he already does all of this. You might include the directions upward (rearing) or downward (going down) - but these are normally responses to play or escape - and by your incorrect requests you may be causing your horse to rear or try to escape. So there you go - every horse is born naturally knowing everything he needs to know, and it takes the first dominant horse (like his dam) to come along to make him realize and demonstrate this. What horses aren't born with is the understanding of human communication. We often speak two very different languages. What many people don't understand (until they learn) is how to communicate to their horse how to perform what they already know. Some of it is more difficult, when you factor in Attitude (the horse's or the person's), but much of this just comes down to practice. 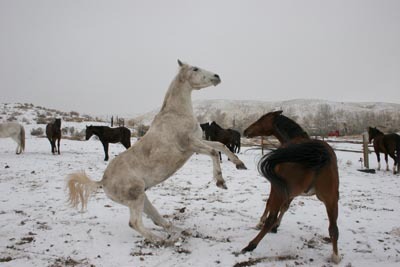 Does your horse disrespect your space when you are on the ground? Does he crowd you? Does he totally ignore you? This is not acceptable. A horse is too big and heavy - and potentially lethal - to not be paying attention to you and following your command. All those Natural Horseman trainers, love them or hate them, agree on one basic thing: start with the ground work. If you don't have the respect of your horse from the ground, you're not going to have it on his back. Your horse should respect you and your space. 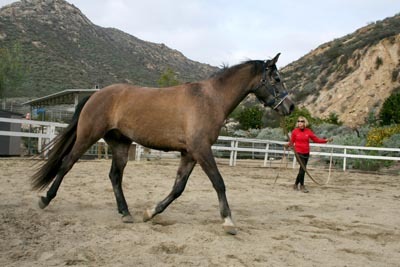 Your horse should move forward, backward, left or right when you ask. It shouldn't take him five minutes to respond, nor 5 seconds; he should do it as soon as you ask him. Nor should it take a shove with a crowbar to get him to move his feet. He should respond instantly to your light touch or gesture. A horse can feel a tiny fly bite his hide, and a horse will move away from another horse's gesture of pinned ears and a head toss; so if he doesn't respond to your ounce of pressure or your gestures that he understands, he is ignoring you and disrespecting you. And you're not going to hurt your horse, or hurt his feelings, if you ask him to do something he already knows. You might, however, ultimately hurt yourself. If you do a little of something every day, it becomes your natural habit. Even if your horse knows everything and responds instantly to everything you ask him, every day, before you get on your horse to ride, do just a little ground work - make him move forward, backward, turn on the forehand (plant his front feet and pivot his hind end), turn on the backhand (plant his back feet and pivot his front end), step to the left, step to the right - you'll get an idea of whether or not he's using his brain today or if his mind is elsewhere. And every day when you climb in the saddle, do the same thing from his back: move him forward, backward, step to the left and right, turn on the forehand, turn on the backhand. Do the same thing when you return from a ride, making that your last dance. It doesn't take two minutes once you've learned to communicate, and it will just become a natural part of your time together - and it will make you and your horse better communicators and better partners. Some horses need more practice than others. Some people need more practice than others. It's easy and doesn't take time out of your ride - when you just do it, a little every day, it becomes part of your ride. Daily practice will become habit, habit will become natural. If you don't know how to teach your horse the basics, get some help. Find a friend or a trainer who knows what he or she is doing and have them teach you; go to a horsemanship clinic; at the least, find videos on Youtube or watch some of those DVDs by the Natural Horseman trainers. Then practice. Start the habit. When your horse respects you more, you become more like partners and you can concentrate on other things - like just having fun together.